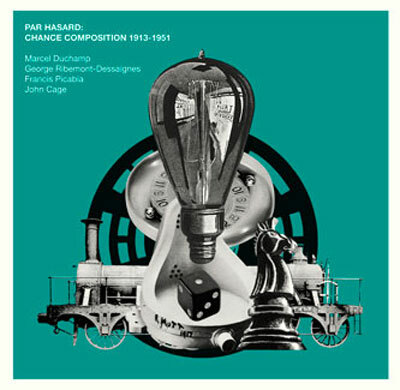 "Par Hasard is a unique collection of avant-garde music by Marcel Duchamp, Francis Picabia, Georges Ribemont-Dessaignes and John Cage, all composed during the first half of the 20th century using chance techniques and operations. All selections are performed on piano. Iconic French conceptual artist Marcel Duchamp conceived both of his Musical errata in 1913. One consists of notes drawn at random from a hat; for the second, balls are dropped through a funnel into wagons drawn by a toy train. "Execution," Duchamp confided, "is rather pointless, in any event." In fact both pieces are strangely beautiful. The remarkable pieces by artists Francis Picabia and Georges Ribemont-Dessaignes were first performed at the Festival Dada in Paris on 26 May 1920. Consisting of three notes repeated to infinity, prankster Picabia described The American Nurse as 'musique sodomiste', while Ribemont-Dessaignes worked with "a sort of pocket roulette wheel that had a dial on which notes were written instead of numbers. By noting the results of the spins of the wheel, I had my melody and the necessary duration. It could have gone on forever." This, then, is the true soundtrack of Paris Dada. Several decades later radical American composer John Cage took a similarly iconoclastic approach to music. A friend of Duchamp since 1942, Cage conceived Music of Changes with the aid of the I Ching; the piece is presented here in its complete form. "The Music of Changes is an object more inhuman than human since chance operations brought it into being," Cage wrote later. "Sounds come together to control a human being and give the work an alarming aspect of a Frankenstein monster." CD booklet features archive images and detailed historical notes." Track 1 performed [...] in Stockholm 1980. Tracks 2 to 5 performed [...] in Mol (Belgium), 2007. Tracks 6 to 9 performed [...] in Cologne 1956. Marcel Duchamp published by Copyright Control. Georges Ribemont-Dessaignes published by SACEM. Francis Picabia published by Copyright Control. John Cage published by Edition Peters Ltd. Par Hasard curated (2012) [...] for LTM. A 70 minute collection of aleatory and indeterminate music composed between 1913 and 1951 performed on piano and prepared piano. Detailed historical notes and archive images in booklet. An LTM Recording (2012). Made in EU. The copyright in this sound recording is owned by LTM. This compilation ℗2014 under exclusive license to LTM. This compilation ©2014 under exclusive license to LTM. Made in EU. Standard jewel case, with 12 pp booklet.